- Heartworm Disease is a serious and potentially fatal disease in pets in the United States and many other parts of the world. It is caused by foot-long worms that live in the heat, lungs, and blood vessels of affected pets, causing severe lung disease, heart failure, and damage to other organs. - Heartworm Disease is transmitted by the mosquito. Adult, female heartworms, living in an infected dog, produce microscopic baby worms, called microfilaria, that circulate in the bloodstream. When a mosquito bites and takes a blood meal from an infected animal, it picks up these baby worms, which develop into "infective stage" larvae over a period of 10 to 14 days. When the infected mosquito bites another dog or cat, the infective larvae are deposited onto the surface of the animals and enter the new host through the mosquito's bite wound. Once inside it take approximately 6 months to mature into adult heartworms. Once mature, heartworms live 5-7 years. - Any dog 6 months and older, needs to be tested before they can be put on a Heartworm Preventative. Even though your dog may appear healthy, on the inside heartworms can be living and thriving. Giving a dog a Heartworm Preventative if it is Heartworm positive and has an adult heartworm infection, can be deadly. - We can test your dog for heartworm by doing a small blood-draw. We then use a heartworm snap test to determine if your pet is positive. This is all done in our on-site laboratory. 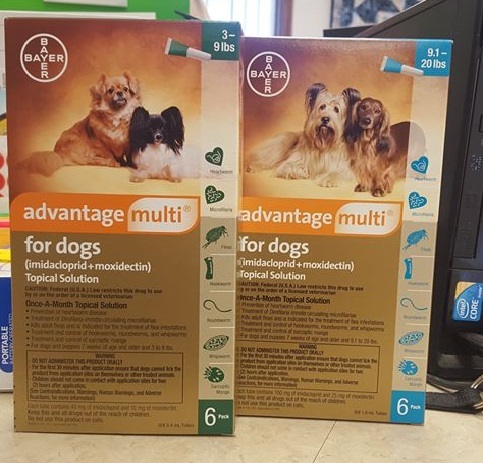 - The best way to reduce your pets risk of infection is to choose one of our safe monthly heartworm preventatives that kill immature worms before they can cause damage. 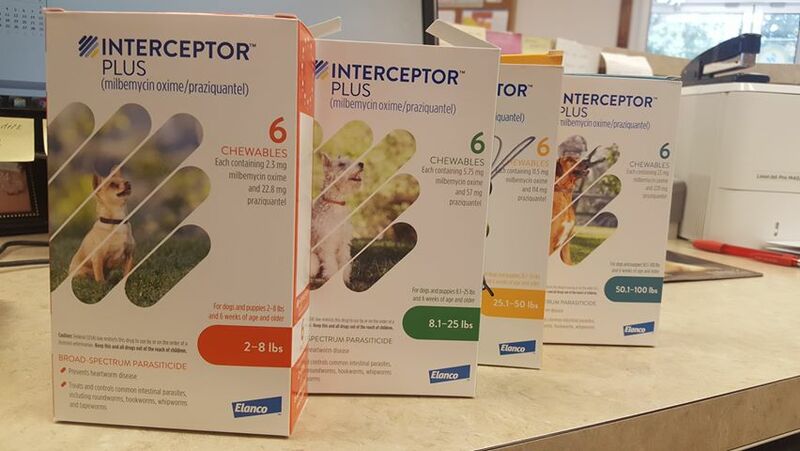 There are many choices of heartworm preventative available. You can choose from topical products to chewable oral medications. 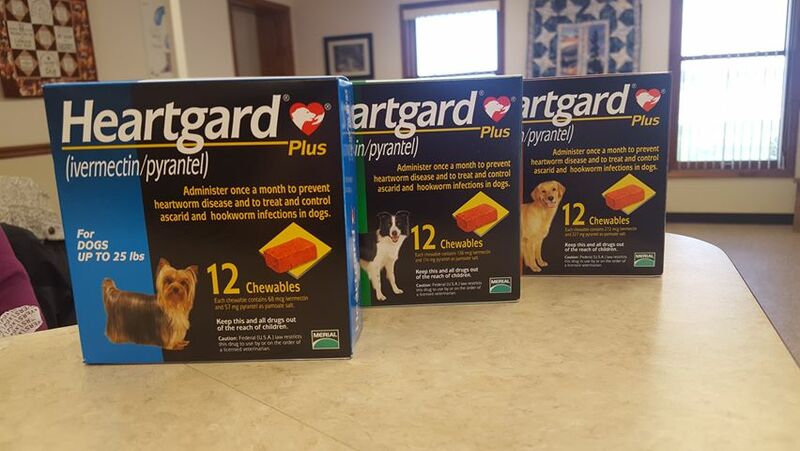 - Heartworm preventatives work to kill of the larval heartworms that made it into the dogs body during the past month. The heartworms will die at certain stages of development, before they can become adult heartworms. However, heartworm preventatives WILL NOT kill adult heartworms that are already present. Why should you keep your pet on a preventative year-round? Due to unpredictable seasonal temperature changes (especially in Indiana), the American Heartworm Society now recommends year-round prevention for animals. It literally takes one mosquito bite and your pet can get Heartworms. - Symptoms in cats can either be very subtle or very dramatic. - Soft, dry coughing is a huge red flag! The parasites make their way to the lungs and start multiplying in the lungs and surrounding veins. Coughing may be most noticeable after exercise and may end with fainting. - Your pet may suddenly seem tired more often. They dont want to go outside and tend to avoid all physical activity. Pets with heartworms are weakend and find it difficult to be active even when performing small tasks. - Even minor physical activities such as eating can become difficult and exhausting chores. - Fluids can also build up around the blood vessels in the lungs. This makes it incredibly difficult for the lungs to oxygenate the blood. - Ribs may seem to protrude and the chest seems to have a "bulging" appearance as a result of adult heartworm infection. This can result from weight loss and anorexia that is also caused by the heartworms. The bulging may also be caused by fluid that has built up in response to the parasite presence. - It is possible for dogs to show symptoms similar to an allergic reaction or asthmatic symptoms in response to the heartworms or their off-spring. - Large numbers of heartworms invade the heart and cause blockage of blood flow (known as caval or vena cava syndrome). Collapse is usually accompanied by shock and red blood cell destruction. Death can follow within days. - If left untreated, heartworm disease can result in death. - Adult Heartworms can grow to 16 inches in length and there can be as many as 250 heartworms in a dogs vital organs at one time. - Almost 300,000 dogs in the U.S. are infected with heartworms each year. - It is difficult, especially on your dog, to treat heartworms once they are established. It is much easier and less expensive to prevent heartworm. 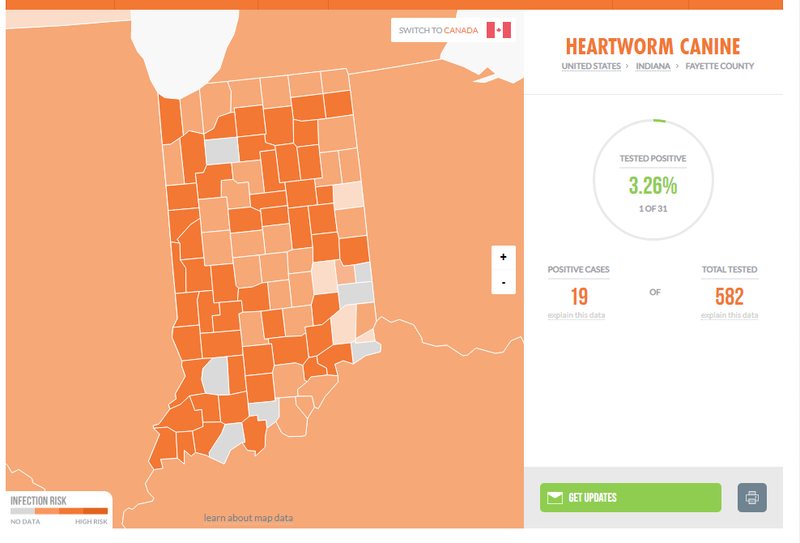 - Heartworm Disease has been diagnosed in all 50 states. - Infection can occur with just one bite. - After diagnosis, a thorough examination of the infected dog should be conducted to evaluate the best course of treatment and potential risks involved. - Treatment can range anywhere from hundreds to thousands of dollars. - Before treatment, your pet will undergo a cardiac workup. - A cardiac workup includes a complete blood count and chemistries, x-rays, and an EKG. This all helps to determine the stage and severity of the disease as well as how the pets organs have been effected. - A Complete Blood Count, Blood Chemistries, Electrolytes: If there are any abnormalities on these tests or blood tests for Kidney and Liver Function, it may suggest the presence of Heartworm Disease. 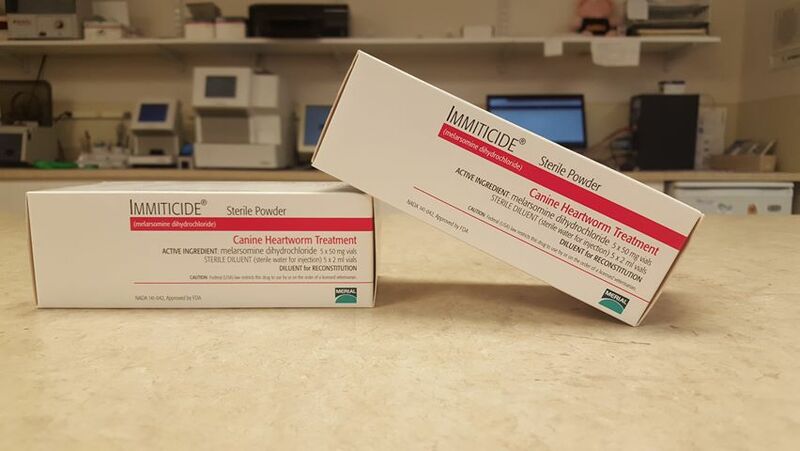 - Immiticide is an injectable drug that kills adult heartworm in dogs. 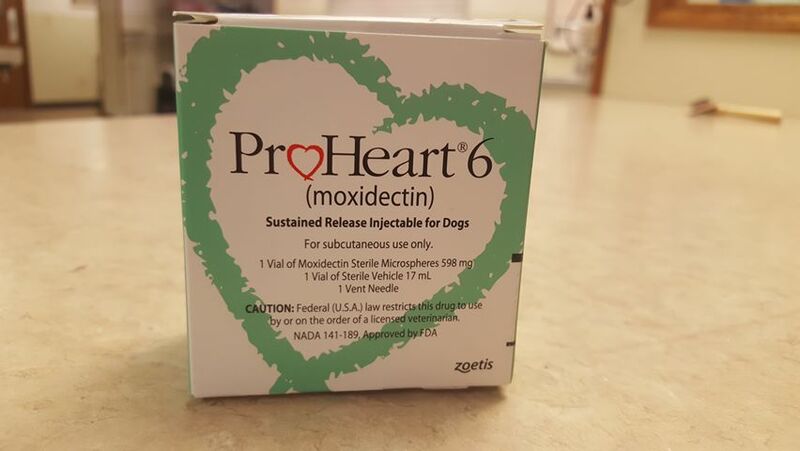 Treatment (not prevention) of Heartworm infection can result in fatal complications, but death from the untreated heartworm infection is far more likely. - Depending on the stage of the disease will determine injection protocols and hospitalization time. - Restricting activity is important during treatment due to risks. Dogs must have 4-6 weeks of cage rest following treatment. - After immiticide treatment is completely finished it is important to start your pet on a heartworm preventative to continue killing the microfilariae. - Your dog must be kept quiet (cage rest) for 4-6 weeks after treatment to help decrease the risk of pulmonary embolism. The adult worms die in a few days and start to decompose. As they break up, they are carried to the lungs, where they lodge in the small blood vessels and are eventually absorbed by the body. 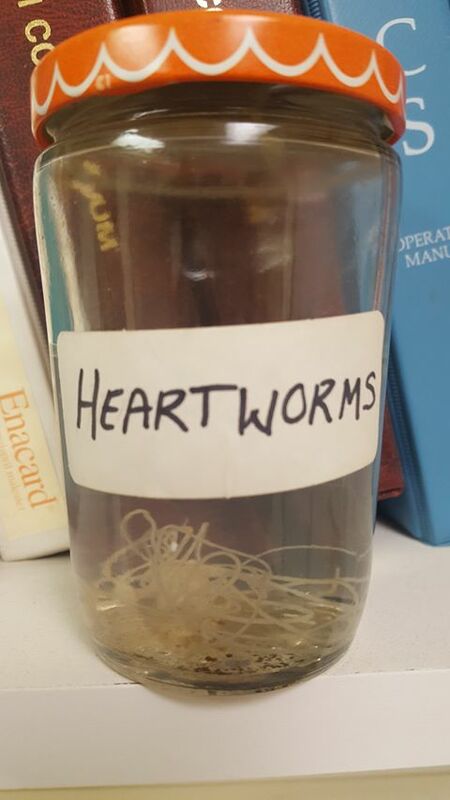 This resoption can take several weeks to months and most post-treatment complications are caused by these fragments of dead heartworms. These fragments can break away and cause death. - The immiticide treatment itself can be hard on the patients body. It is made up of arsenic containing compounds.